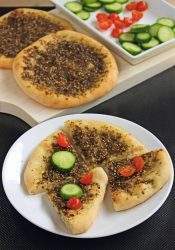 Za'atar flatbread is a simple flatbread flavored with a Middle Eastern spice blend called the Za'atar which is a mixture of sumac, thyme, oregano, sesame seeds and salt. In a bowl, add the warm water, sugar and active dry yeast and mix well. Let the yeast mixture sit for about 10 minutes or until bubbly and frothy. In a wide bowl, add the flour and the salt. Add the frothy yeast water and start kneading the dough. Add 1 TBSP of olive oil and continue kneading until you have a soft dough. Cover the dough and let it rest for at least an hour or until double in volume. Once the dough has doubled in size, punch it down gently and divide it into 4 equal pieces. Roll each piece into a tight ball and let it sit covered for about 15 minutes. In the meantime, preheat the oven to 425 F and place a pizza stone in the oven when it is preheating. If you don't have a pizza stone, we can just bake it on a baking sheet. Roll each ball into a 1/4 inch thick circle, about 6 inches wide. Using your fingers, spread 1/4 of the Za'atar spice mixture on the surface of the rolled dough. Leave a little border around without the spice. Also make small indentations in the dough when spreading the spice mixture. Place the prepared dough on a parchment paper to easily slide on to the pizza stone. I was able to place 2 at a time on a piece of parchment. Bake the flatbread for about 10 to 12 minutes or until light brown at the edges. Remove from the oven and let it cool a bit and then slice and serve. You could top it with fresh cheese or cucumbers and tomatoes.